This paperback book sends a message of hope to everyone who reads it. CLICK HERE to get Ettie’s Book. Ettie Rutherford, M.Ed, is an educational consultant, the Founder of ER Education Consulting, and CEO of Women Are Worthy (http://www.womenrworthy.com), a training company that empowers women to reach their highest potential. Thank you for writing this engaging and inspiring book. I can relate to much of what you experienced and so will many women. I believe women who get the opportunity to read your book will be enlightened and empowered. This book would encourage women to acknowledge their strengths and rethink their life’s journey. I have already secured a few copies for friends and family. I know they will benefit from this read. Congratulations again on your accomplishments, overcoming obstacles and for sharing your wisdom in this book. I have now finished reading your book and what a story! I wish I had this book some 30 years ago, my life would have been so different. I am thankful though that it is here in time for my daughter and any grandchildren, should I be so blessed. When I read about your life in Jamaica as a youngster, the family unit and then your longing for and missing that happy life while a new immigrant living in Smith, Alberta. I could not help but relive my own early life in Canada, having come from Barbados. I am extremely glad that you have found happiness in love again and I admire your success as an educator, wife, mother and champion for rights, equality and fairness for women, especially immigrant women. 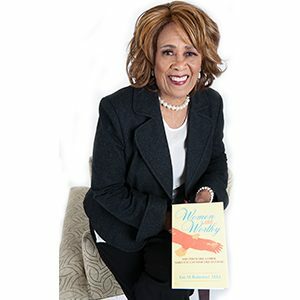 Ettie Rutherford (BEd’71, MEd’78) has penned Women Are Worthy: Why Perch Like a Chick When You Can Soar Like an Eagle?, a self-help book focusing on overcoming obstacles and creating opportunities. Part memoir, part self-help, the book chronicles her journey and survival practices. She uses her life story to show women they can use challenges as stepping stones. Ettie has never taken the easy road, and she’s never been one to step away from a challenge. Her story starts with her graduation from a prestigious Jamaican high school, and the surprise of a teenage pregnancy. It picks up in Canada in 1967, in a small northern Alberta town, where Ettie is teaching, raising four small children, and living with an emotionally abusive husband. After the family moves to Calgary, Ettie is abandoned by her ex-husband. Many people would have given up at that point, but not Ettie. Despite teaching full-time and rearing three sons and a daughter, she persevered until she gained her Master’s degree. Reflecting on that difficult time in her life, Ettie credits education for getting her through the challenges. “Education is the key to success for everyone, but especially for immigrant women,” she says. After 17 years with the Calgary Catholic School Board, Rutherford moved to the York Region Catholic School District in Ontario. Now a retired principal, Ettie Rutherford is the owner of both ER Education Consulting which offers services for educators and parents; as well as Women Are Worthy, which provides workshops and coaching exclusively for women. Through these companies, Ettie continues to teach and work with women. She emphasizes that her book is an extension of her desire to help others through the lessons she has learned. Ettie urges everyone to realize the devastating effects of emotional abuse, often minimized because there are no broken bones or other physical manifestations. Her book sends the message that, faced with seemingly insurmountable challenges, a successful and fulfilling life can be achieved through perseverance, patience and a solid education.